“The building stands at the Regent Street end of Portland Place. 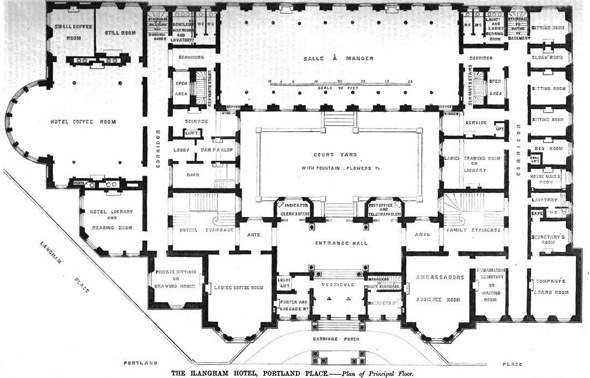 In addition to the accommodation shown on the ground floor, it contains 300 bed-rooms, upwards of thirty-six sitting and drawing rooms, many of them en suite, with bed, dressing, and bath rooms, billiard and smoking, besides servants’ and other offices. The kitchen is beneath the coffee-room of the hotel, and is similar in size, being also 20 feet in height. Over the other apartments in the basement is a mezzanine floor, occupied by servants’ bedrooms, housekeeper’s and ladies-maids’ sittingrooms, visitors’ servants, dining-rooms, &c The basement also contains a large swimming-bath, which, like the kitchen, occupies the height of the two-stories beneath the ground floor. The corridors and staircases throughout are of Portland stone. The open court in the centre of the building will be filled with fountain and flowers, etc. The whole of the public and private rooms will be finished in a neat and inexpensive manner. The building, which is now rapidly progressing, is from a design by Mr. John Giles, of London, architect, selected by the board of directors in a limited competition. It is being carried out by him in conjunction with Mr. Murray, the architect of the Palace Hotel. The contractors are the Messrs. Lncas, Brothers; the builders’ foreman, Mr. Bullifant; the clerk of works, Mr. Richards.” From The Builder, July 25 1863.